Australian athletics superstar and Commonwealth Games gold medal holder Jana Pittman is best known for her stunning efforts as a champion hurdler. 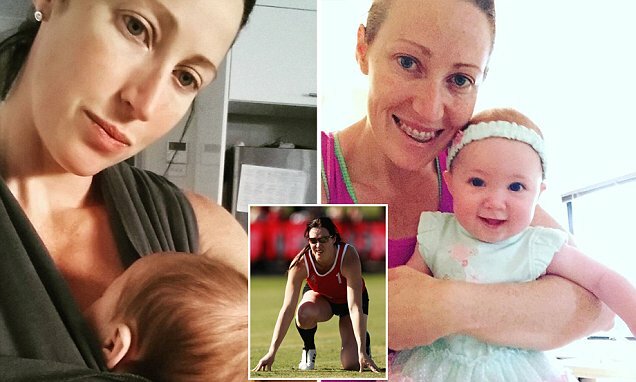 And while life after her sporting career has put family centre stage, the 35-year-old mother-of-three, says this hasn't been without its struggles. First, there was a shock cancer scare in 2014 while she was undergoing IVF treatment. And now, the former Olympian has revealed ongoing difficulties with breastfeeding her babies. Explaining her situation, Jana said because she was young when she gave birth to her first child she didn't imagine she would experience any problems. 'I had just won the World Champs previously and I thought I am going to be able to master this beautifully. And it was a complete fail within three or four weeks,' she said. Mastitis is a condition breastfeeding mothers can suffering from, one that's usually the result of a blocked milk duct that hasn't cleared. Jana gave birth to her son Cornelius (a child she had with first husband Chris Rawlinson) nine years ago. In the past four years, the elite athlete has had two daughters, Emily and Jemima, via IVF. She revealed that despite her earlier difficulties with breastfeeding this was something she was determined to overcome.